2014 Chapter 5: A new supporting pillar for the OFP – the ‘Society for the Promotion of Research in Ostia’. 2015 Campaign: A view back & plans for the future! 2016 Chapter 2. Temple votives and kitchen equipment – an inventory of the Capitolium-Cult (and its predecessors)? Why do we use laserscans? This section is dedicated to specialists. Our aim is to provide a discussion-forum about the possibilities and limits of dating based on the level-raises of the streets and buildings in Ostia. If you are a researcher, and you have any information about level-raises from your experience or from older unpublished excavations and trenches, then feel free to contact us by email! We look forward to a fruitful discussion, because sharing information and knowledge is a ‘win-win’-situation: with every new parallel to the phenomenon you can cite, research becomes more comprehensive. We start with one example: theories of so-called ‘Flavian’ and ‘Hadrianic’ level-raises. This phenomenon is discussed at the Piazzale delle Corporazioni and its immediate surroundings, the theatre (for example, see Battistelli P. – Greco G. 2002). At least one would expect similar level-raises at all other major plazas and streets in the city. Felix Hülsebeck is curently working on his master’s thesis regarding the stratigraphy of his trenches from 2011-2012 at MFP. In this regard, comparisons with other trenches in the Forum’s area, Forum’s Basilica and Forum’s ‘Curia’ will be very interesting. 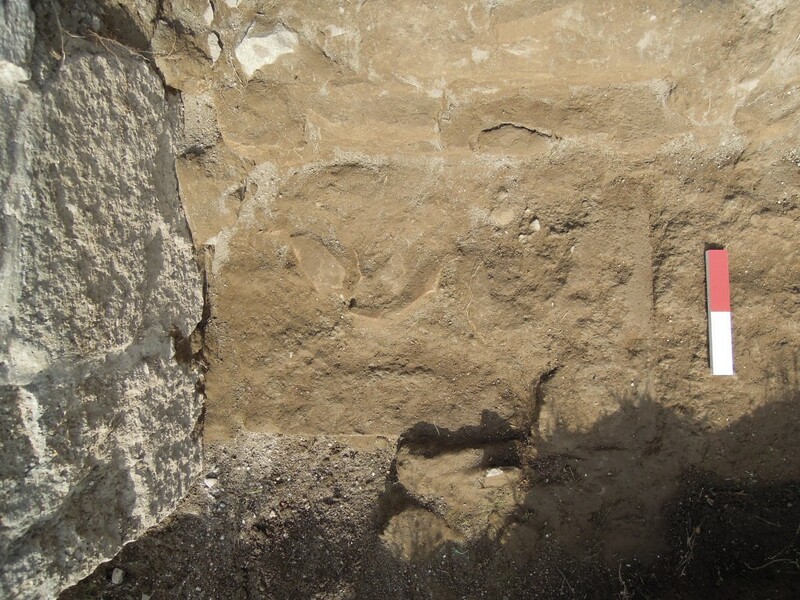 The same level-difference of 40 cm can be found between the imprint of a now removed late antique statue-base (see picture below) and the surface-level of the outermost wall of the portico MFP. This could be interpreted as the extension of the portico onto the former street area is completely late antique. This means that the local fill up to the level of the cut off pillars occured on both sides of the wall m1, which bisects the portico in two parts (inner-part from backwall to m1, outer-part from m1 to present granite-columns), in one singular event in Late Antiquity after a certain collapse-catastrophe. 1. Bipedales-fundament of pillars relating to street-level. 2a. Possible construction of inter-pillar wall? 2b. Level-raise of 20 cm in the inner-part and opus spicatum floor on top, but as part of an unfinished concept of tabernae, which were found in the northern part only. 2c. A similar level-raise in the outer-part with basalt? At this time, the pillars would still have been functioning. 3. 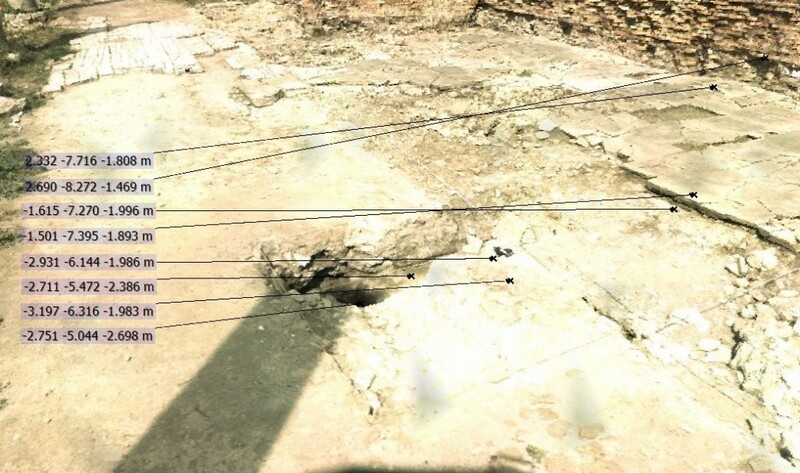 Building of the inter-pillar wall with related construction-pit in the inner-part. 4. Filling of basalt-layer in the outer-part. 5. Filling of tuffelli-layer in the outer-part. 6. Cutting of the pillars. 7. 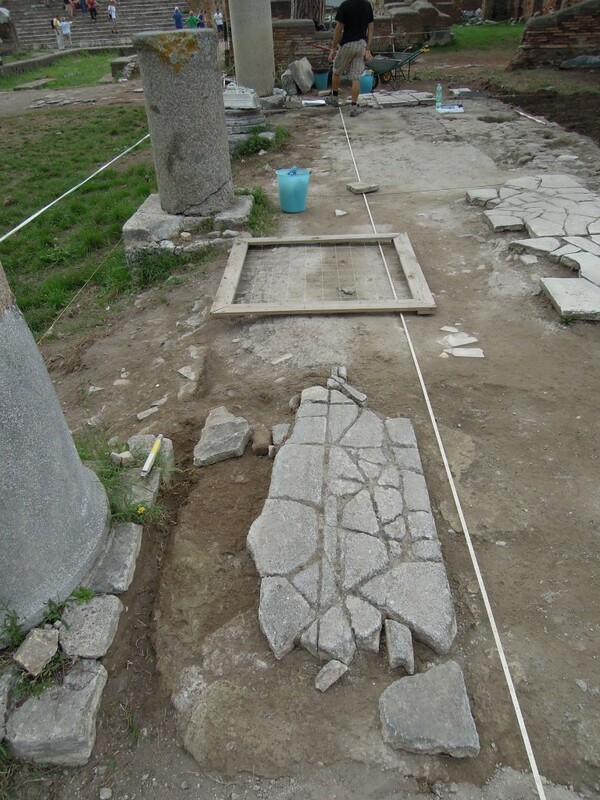 Pavement on top of pillars and outer-part. 8. Re-fill of the construction-pit of the inter-pillar wall in the inner-part. 9. 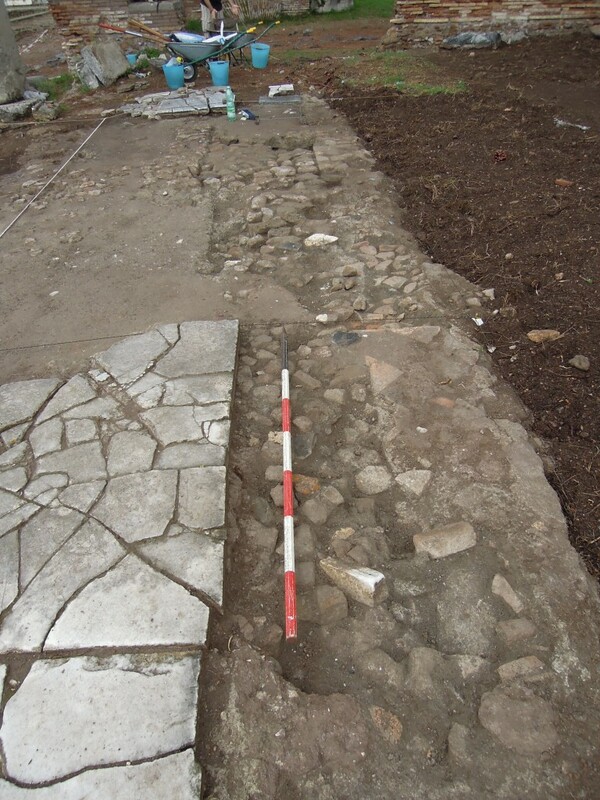 Pavement on top of re-fill with wall-fragments A, connected to the areas of pavement above the Augustan tabernae. Copyright © 2019 Ostia Forum Project.